The Rebel Sweetheart. : Spotlight | Human Heart Nature Pollution Defense Hydrating Emulsion. 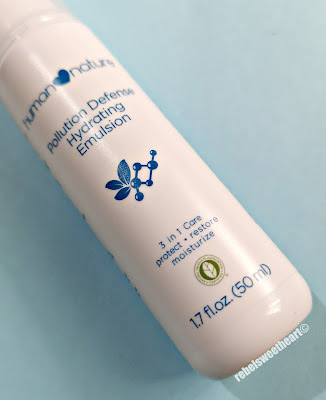 Spotlight | Human Heart Nature Pollution Defense Hydrating Emulsion. If you're a fan of Human Heart Nature's Pollution Defense Face Mask or Pollution Defense Face Cleanser, you'll be delighted to know that there's a new addition to the family - the Pollution Defense Hydrating Emulsion. Human Heart Nature Pollution Defense Hydrating Emulsion. What's an emulsion, you ask? Emulsions are moisturizers that are typically water-based. Unlike most face creams, they have a thinner consistency, and go on lighter on the face. In a typical Korean skincare routine, emulsions are the in-between product between essences and creams. However, you can always tweak the order of usage depending on your skin type or the current season. For those with oily skin, emulsions can be the final moisturizing step, right before you apply sun protection. Since they're lighter and easily absorbed by the skin, people with oily skin prefer emulsions as a way to keep their skin hydrated without adding more 'grease' to their skin. Similarly, if you're living in a tropical country or it's currently summer in your area, an emulsion can keep your skin cool and light, and hydrated all at the same time. Protect + Restore + Moisturize. Now what makes this product noteworthy is its ability to protect the skin against air pollutants. 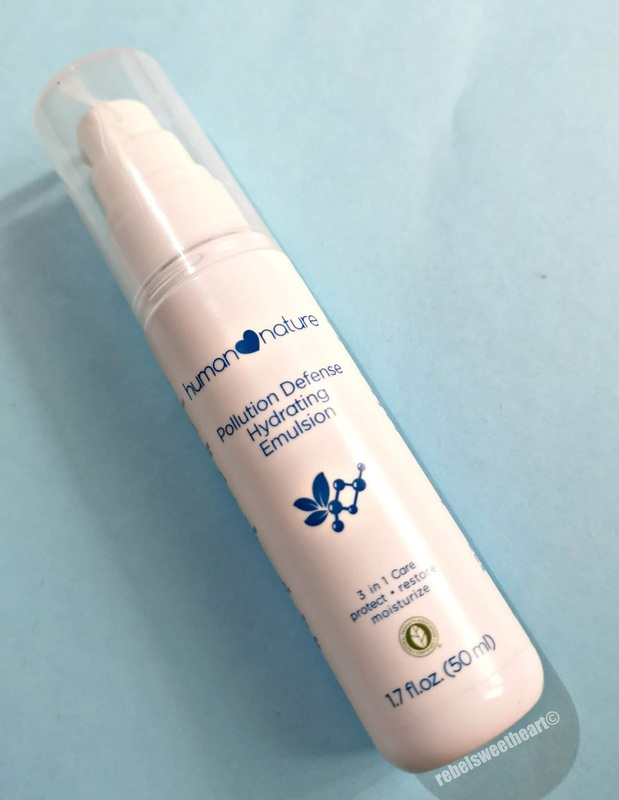 Like the Pollution Defense Face Mask and the Pollution Defense Face Cleanser, the Human Heart Nature Pollution Defense Hydrating Emulsion contains moringa seed extract, which is exceptionally good at lifting out dirt and grime from the skin and has excellent anti-aging properties. It's also infused with Vitamin E and passion fruit seed oil which provides protection from free-radical damage and promotes healthy skin and cell growth. In addition, this product contains cocoa butter which nourishes the skin and gives this product a subtle, sweet scent - a far cry from the Pollution Defense Mask's earthy, herbal scent. 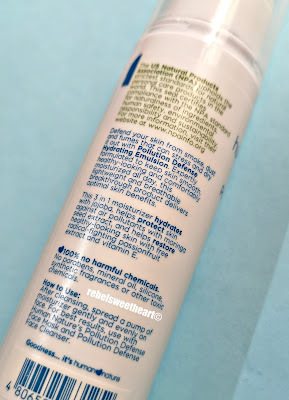 Like the Pollution Defense Face Cleanser, this emulsion comes in a 50 mL pump bottle. To use, simply pump the product out and spread it gently and evenly on the face. One pump of the Human Heart Nature Pollution Defense Hydrating Emulsion. Spreads thin and light on the skin. As you can see, this product has a light and milky consistency, allowing for easy skin absorption. 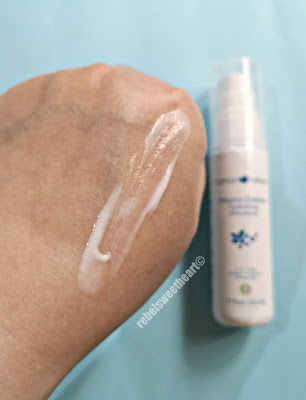 I use this emulsion as the second-to-the-last step in my daytime skincare routine (the last step being the sun base), and I love how this product keeps my skin hydrated and moisturized all day long without turning my face into a grease ball. This product is also ideal for night time use at it boosts the skin's ability to absorb nutrients. At night, I apply this right before the Innisfree Orchid Enriched Cream, which I will review in this blog later on. I've been using this emulsion since it was launched two weeks ago, and so far, so good! Looks like this product will give my Korean brand emulsions a run for their money! The Human Heart Nature Pollution Defense Hydrating Emulsion retails for Php 350 per bottle and can be purchased online, and at Human Heart Nature branches across the country. As an introductory offer, you can purchase this emulsion together with the Pollution Defense Face Cleanser for only Php 545 - that's Php 50 off the regular price! This looks like a great product. I have oily skin, and still at age 30 I do not have a good skin care routine down. I'll get there, one day! THINNER IS WAY BETTER FOR ME! I hate thick creams and so does my skin!!! NOT HEARD OF PRODUCTS LIKE THESE SO THANKS FOR BRINGING THEM TO MY ATTENTION! SOUNDS LIKE ITS REALLY GOOD FOR YOUR SKIN. This seems like a very promising product! I want to try it too! This is another great product to recommend for our skin protection. This should be our priority for our skin care. 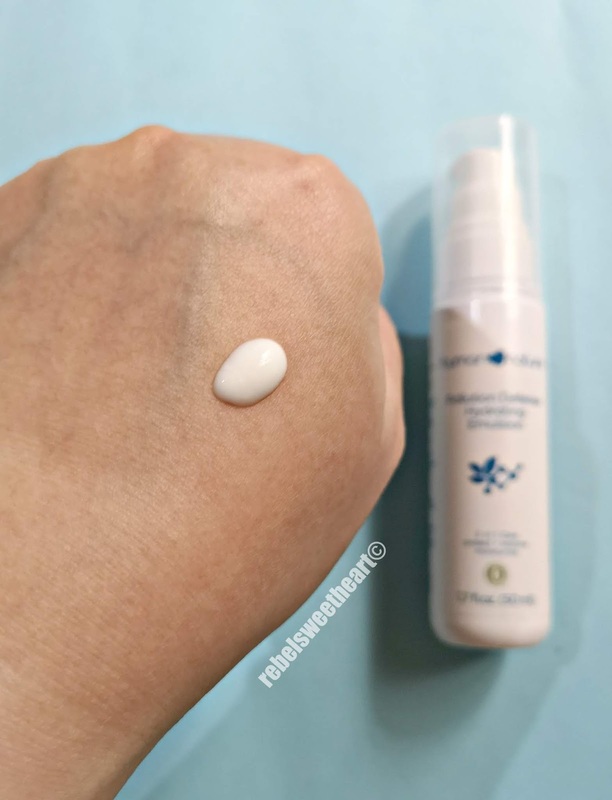 Wow, it looks like a good product and looks like a perfect one for my skin. I definitely need to try this. Great review and I like how this is water based, that way it is not that oily after the while applying it. I always love trying new skincare! I've never heard of skincare to help combat the effects of pollution though! Human NAture is really a great line of skincare product. I have been using this since then and it has really a great effect on my kin. This looks like a great product. I like that it is thinner than the usual moisturiser which is great for me. I like that in a product. 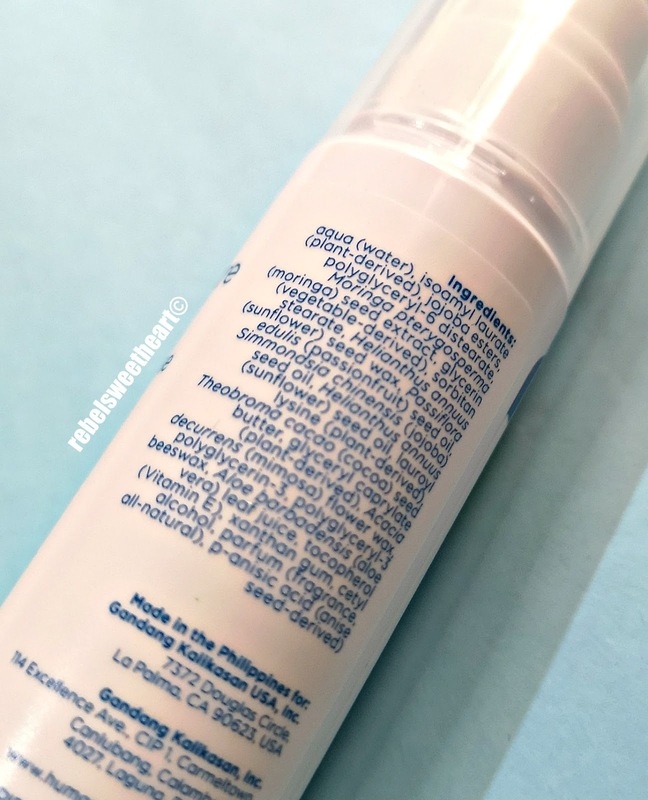 My dry skin can use all the moisturizer it can get so a hydrating emulsion is right up my alley! sounds like it's a great deal right now! Looks like a really nice line of product to try!